Suspension oil specifically designed for lever arm and vane type shock absorbers fitted to cars covering the vintage and classic period. Heavier grade to increase the damping rate or to suit a non-piston type shock absorber. Ideal for competition use. 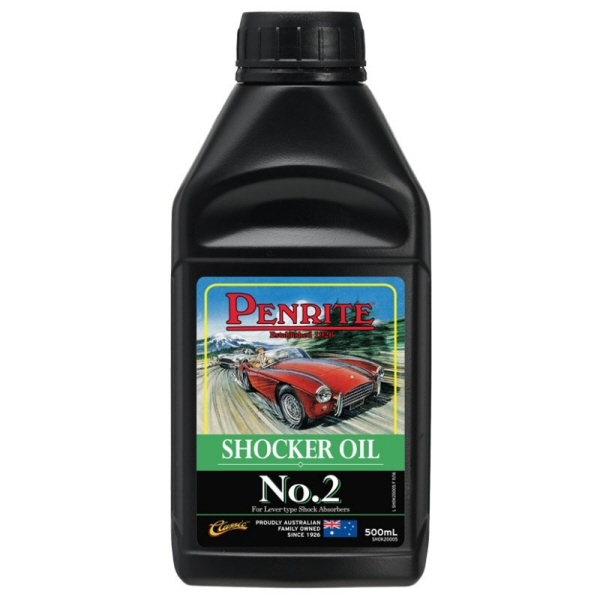 Shocker Oil No.1 & No.2 are suspension oils specifically designed for lever arm and vane type shock absorbers fitted to cars covering the vintage and classic period. They contain anti-corrosion and anti-wear additives for enhanced protection. Shocker Oil No.2 is suitable for Armstrong lever action type shock absorbers in either single or double acting where fast road and competition use is anticipated. This oil may also be used in Berg type shock absorbers with adjustable automatic valves and also Houdaille shock absorbers using the vane type system. Shocker Oil No.2 can also be used as a motorcycle fork oil where a heavy SAE 20 oil was originally specified.